Last time I talked travel, it was about destinations built for backpackers: Remote enough and with just the right amenities to make it an adventure. Europe has another spot that’s much less exotic, but because it sits almost literally in the middle of everything and yet has fairly pedestrian to-do’s, makes it an almost perfect vacation in the middle of a vacation. Salzburg, Austria is one of the quietest towns with more than 100,000 people you’ll ever come across. It’s not for lack of trying. Salzburg gave the world Mozart, and 200 years later came back with The Sound of Music (more on that later), so while it’s not Rammstein they’re birthing, they’re still a people familiar with the volume knob throughout the ages. The main visual point of the town is its fortress, the Festung Hohensalzburg, set high on a hill above the city without the overlording, foreboding tones it implies. For one, it’s bright white in a city of sun and lightly colored buildings. For another, it was established not to rain doom on a rebellious populace, but in order to effectively tax salt coming down the Sal(salt)zach river. A salt fortress. Hence, Salz(salt)burg. Again, not as metal as it seems like it could be, but close enough for jazz. The city is peppered with some of the baroquiest baroque churches you could hope to come across, along with references to…well…Mozart’s balls. It’s a ubiquitous chocolate treat in the city honoring their favorite son, but unless something’s changed in the last little bit since I’ve been there, it’s frequently directly translated as Mozart’s balls on the cardboard cutouts covering the city. There was a ten year gap between my visits to the city, and amongst the things that had not changed positions in the intervening years were these stands in strategic locations. Most tourists that find their way to the city immediately leave on one of the many Sound Of Music tours, covering the major sights from the Julie Andrews movie. Tours by foot, by bus, by helicopter, by bicycle…however you want to get to those sites, the city is eager for you to get there. Speaking of, while you can get to Salzburg via a sizable airport, it’s much more there for folks looking to get into the alps to ski, rather than out to Salzburg for bike tours and balls (it’s apparently a 13 year-old boy’s paradise for all the opportunities to say that over and over again). 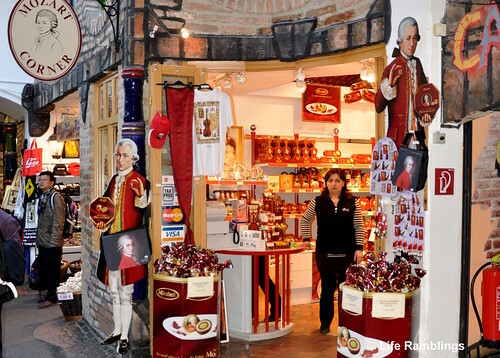 Even for Christopher Plummer devotees, there’s only so much reason to intentionally go to Salzburg. Except that it sits in the middle of the great train thoroughfares of the continent, and between Europe’s biggest tourist destinations and population centers: Italy to the South, southern Germany just a sneeze to the West and Switzerland beyond, Vienna to the East, and a fast train to Paris to the North. If you’re on a train or a coach and covering any kind of distance, chances are that your route is going to cut through Salzburg. Enter the vacation within a vacation. Take a day off in the middle of one of these trips, and you will not regret it. Grab a walk through the city, its mix of architecture and riparian (little SAT word there for you) views. Take in Mozart’s home, and a SoM tour if you must. Play a little life-size chess in the square below the fortress. And then, either mid-morning for a lunch stop or mid-afternoon for dinner, start making your way up the steep, steep ramparts to the fortress. The weak of knee or spirit can always take a cable car – what comes next is infinitely better better if it’s earned, so take the ramp if you’ve got it in you. Once you have your breath back, start walking the walls and lose it all over again for completely different reasons. To the outside of the city you can take in the alpine river Salzach, the mountains that lead the way to Switzerland and Vienna, the German border and the blasted tourists headed to the Sound of Music mansion. To the inside, a view of the city that gives a sense of its history and its surprising size. Pictures can barely begin to do justice…it’s a view that is vastly improved with the actual mountain air in your lungs. And then grab a table at the cafe, preferably near the wall to take in the view. Grab some schnitzel or something else suitably Teutonic. Add a dessert. And a coffee. Take your time. Because while your next stop is probably one of the great tourist stops of Europe – Venice, Paris, Munich, Florence, Vienna – for the moment, you are actually on vacation. Not a bad day trip at all for a big little town built on salt, harpsichords, singing nuns, and yes – balls.